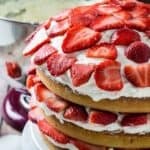 Three layers of moist vanilla cake, sweet whipped cream cheese frosting, and sliced strawberries piled high to make the ultimate Gluten Free Strawberry Cake. This is the perfect springtime strawberry dessert, and is sure to impress your guests! Do you know what’s better than a gluten free strawberry shortcake? That’s right, it’s layers and layers and layers of gluten free strawberry cake! Three layers, to be exact. Don’t even get me started on this frosting. It’s sturdy like a cream cheese frosting, but light like a whipped cream frosting, and goes perfectly with strawberries. This gluten free dessert is so good, even your non gluten free guests will be asking for seconds! So, what have I been doing, besides making super-awesome layer cakes? I’ve been having super-awesome beach adventures in the Gulf of Mexico! It’s ok to be jealous. Last weekend Andrew and I spent our day hunting for shark teeth and fishing, where we found about a bucket full of seashells and a week’s worth of vitamin D. I still haven’t caught any fish, but I’m not giving up! I did, however, catch a lovely salmon fillet at our local Publix grocery store. It was delicious. But enough about me, let’s get back to what we’re really all here for. Does anyone else feel a little whoozy or light-headed? It’s ok, you’re just in love. This is one of my favorite gluten free vanilla cake recipes. It’s light, yet moist and full of flavor, and basically my go-to for multiple recipes. It’s doesn’t crumble like some gluten free cakes, and even my non-GF guests loved it! Here’s one of my favorite guest posts I wrote using this vanilla cake: Gluten Free Salted Caramel Cupcakes for Dinner Then Dessert. It’s just amazing. 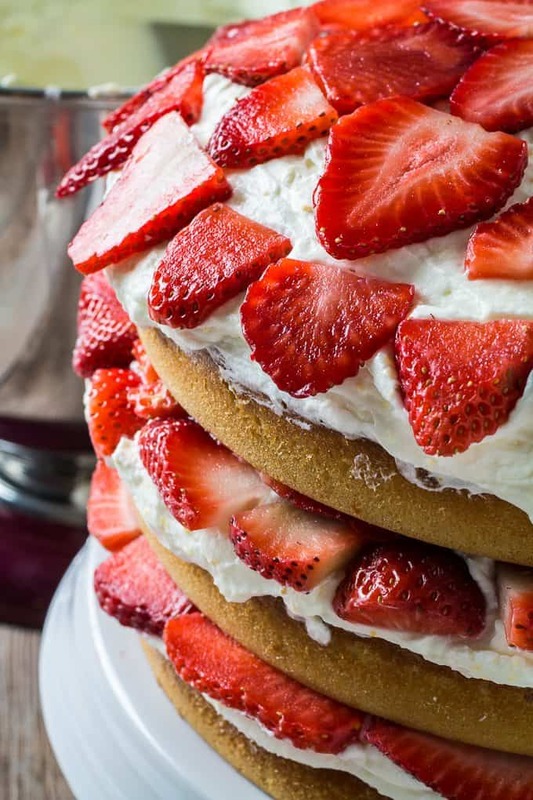 It’s not overly sweet (ahem – if you like that sort of thing, you can add another 1/2 cup-ish confectioners sugar), and pairs perfectly with the strawberries in a strawberries-and-whipped-cream-are-amazing kind of way. And the orange zest just adds another dimension of brightness to this springtime dessert. Let me tell you, it is just good on many different levels layers. Now if you’ll excuse me, I have another piece of gluten free strawberry cake heaven calling my name. Is that you, cake-heaven? I’ll be right there. Preheat oven to 350°F. Grease 3 cake pans and set aside. Next, beat in eggs one at a time. In a separate bowl, combine salt, flour, and baking powder. Add flour mixture to egg mixture slowly, until fully incorporated. Next, add cream until all ingredients are well combined. Add batter to cake pans. Bake for 20-25 minutes, or until a toothpick comes out clean. Remove cakes from oven and allow to cool completely before frosting. When cakes are completely cool, remove first cake from pan and place on serving plate. 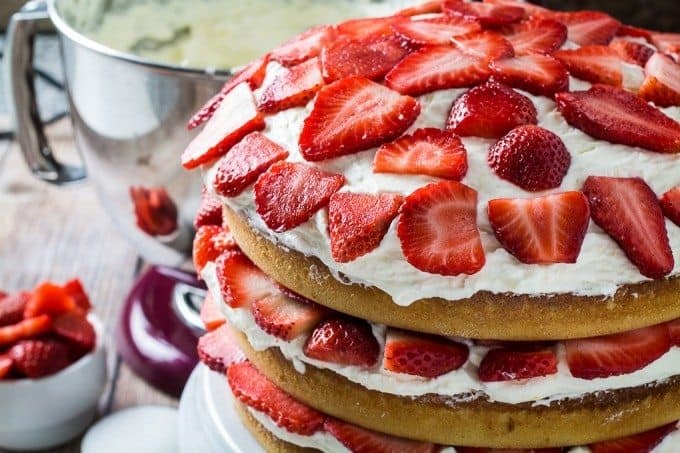 Spread layer of frosting, then decoratively place a layer of strawberries on top. Place a spoonful of frosting on top of strawberries (in the middle). Add next layer of cake. 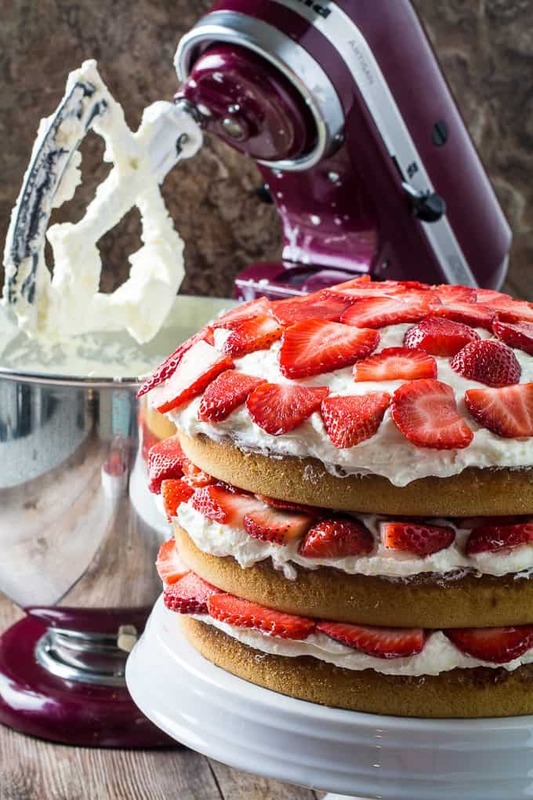 Repeat frosting and strawberries for the next two layers. In a stand mixer (or with an electric hand mixer) beat heavy cream and cream of tar tar on low to med-low until stiff peaks appear (this may take a few minutes). Once whipped, place cream in a bowl and refrigerate. With a stand mixer, beat cream cheese, sugar, vanilla extract, and orange zest together. On low, slowly add whipped cream to cream cheese mixture to combine. Once just combined, refrigerate until ready to use. If your cake bakes up taller in the middle, you make have to take a knife and cut just the very top layer off. This will prevent the cakes from sliding off of each other. Don't do this for the very top layer. I recommend refrigerating this cake until you're ready to serve. Because the frosting is whipped cream based, it could melt. Wow! This looks so good I will have to try this soon. 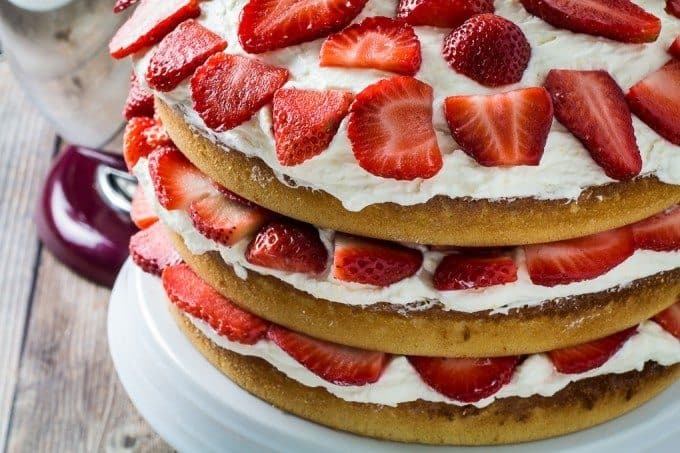 Nothing better than cake, whipped cream , cream cheese and strawberries! This looks so good! I want to bake it for my mom, but I actually want to make smaller versions. I have small cake pans which are about 3 cm (a little over one.inch) high and about 3 inches in diameter. Could you make an estimation of how long they should be in the oven and whether I should put the oven on a different temperature? Hi Valerie! I’d keep the same oven temperature, but I might check it at 10-15 minutes. I would probably take cupcakes out at around 20-25 minutes, and it sounds like your mini-pans are a little smaller than that, right? I would definitely keep a close eye on them. Does your oven have a light? That can help you watch them without opening the door, which drops the oven temperature, until they look ready. Your desserts look very good, the only problem is my granddaughter has Celiac but she us a Diabetic. Also my husband is board-line diabetic. How would I make the recipes healthy? Hi Cecelia, Thanks for the compliment! You could sub in some artificial sweeteners, but I’d have to play with the recipe to really get it right. 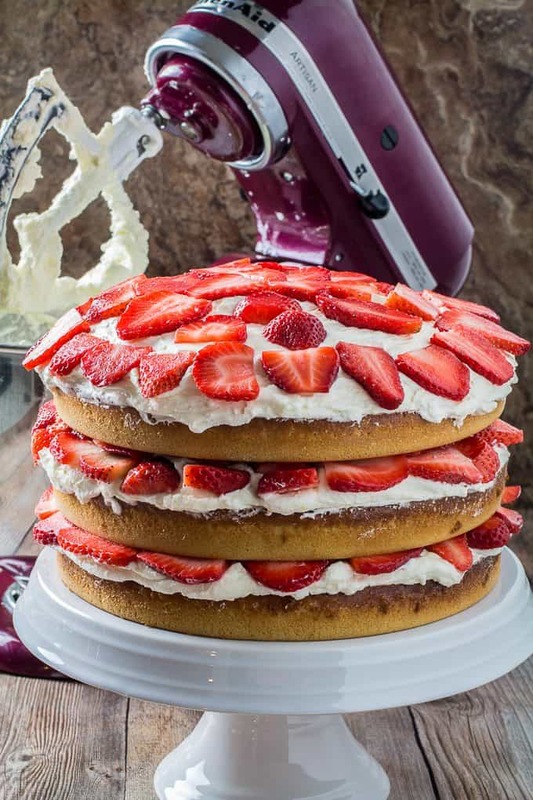 Have you every tried making an angel food cake? Depending on their carb restrictions, it’s usually lower carb than regular cakes but can still be just as good! This looks so yummy and is making me reeeaallly excited for spring! Bring on the berries! Hi, this looks delicious – thank you for putting it up – I’m thinking of making this for Mother’s Day. Just one thing, though, what size cake tins do you use? Are these 7 inch diameter? Hi Jen, this is a great Mother’s Day recipe, let me know how it goes! The cake tins I use are 9-inch round. If you have larger ones or square ones it would still work, just keep in mind if they’re bigger than 9-inches it will cook faster, and look thinner than the photos. I think it would still turn out great, though!